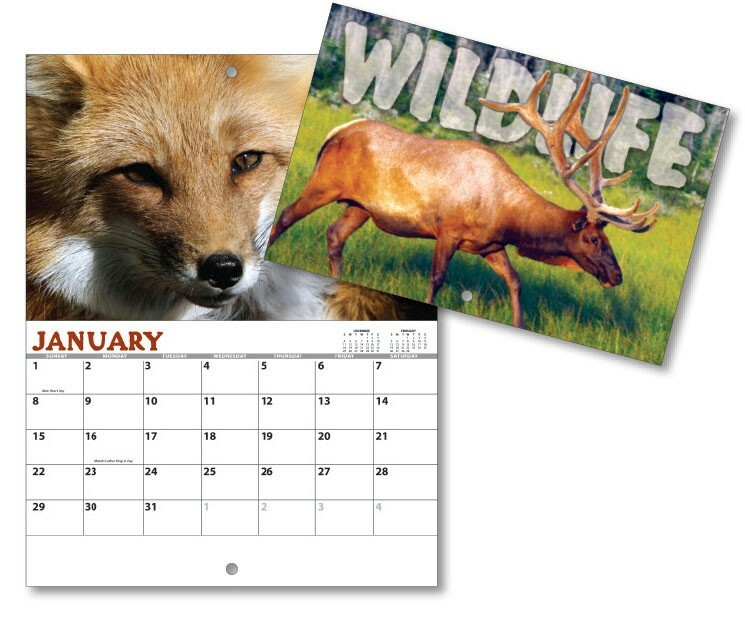 Go into the wild with this calendar. 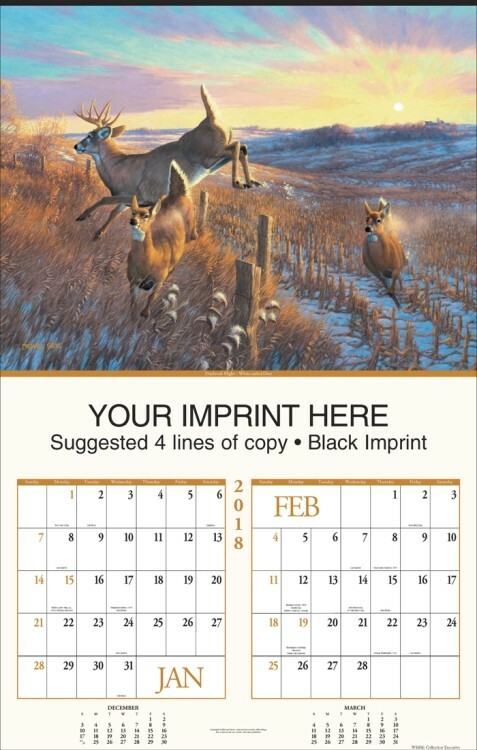 Top wildlife artists capture animals in their natural settings. 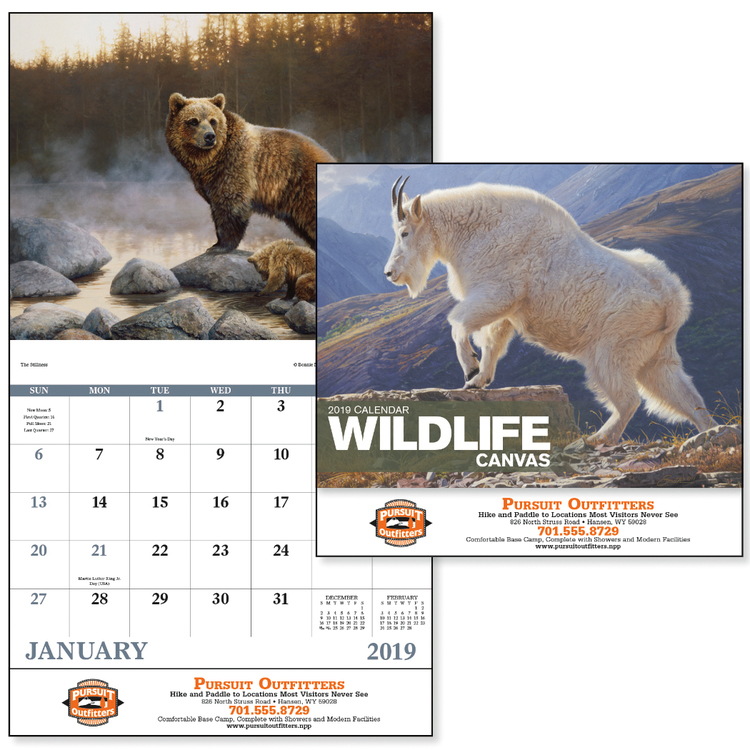 This artistic and realistic wildlife calendar is sure to grab attention for any advertisement. 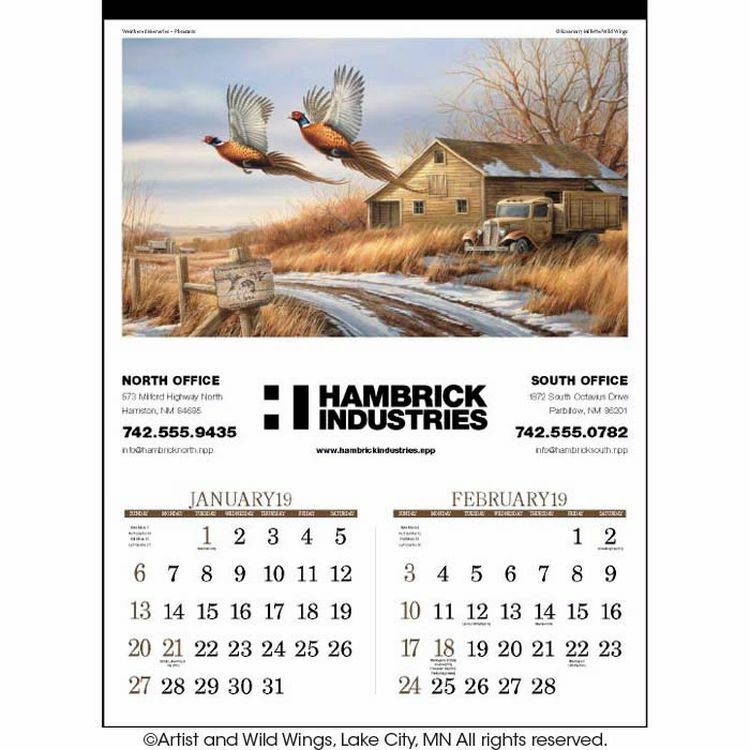 Hunting or outdoor-themed businesses are ideal prospects for this calendar. 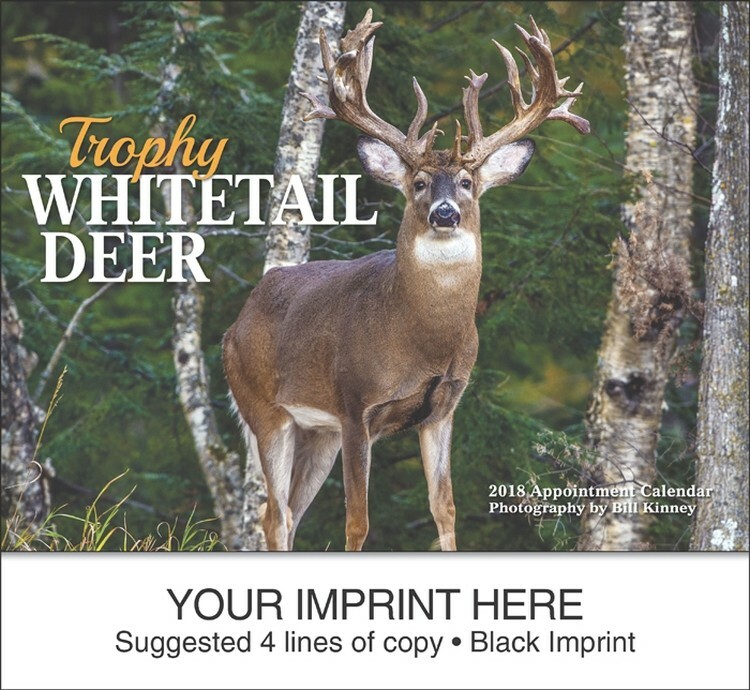 An item any sportsman will be proud to display and use. 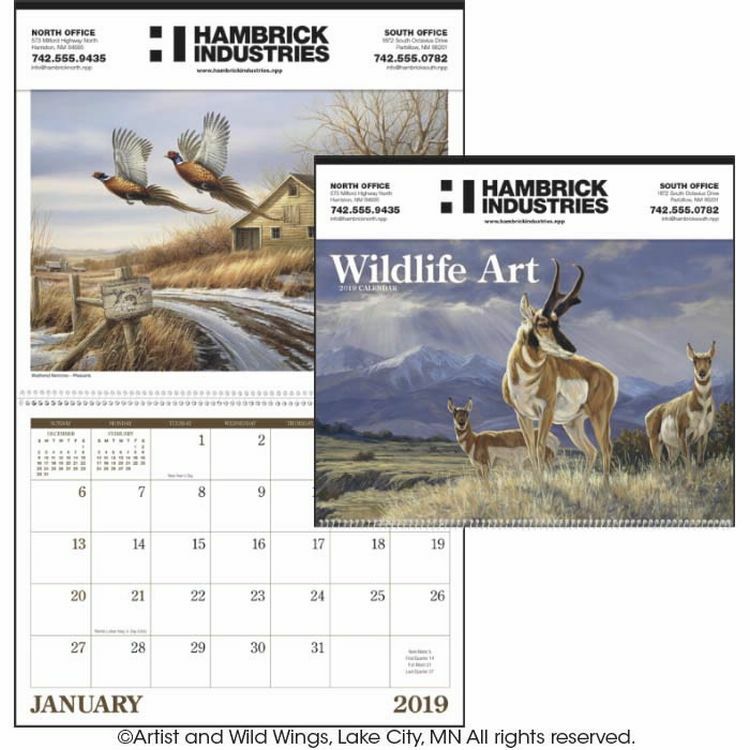 Go outdoors with America's foremost family of wildlife artists. 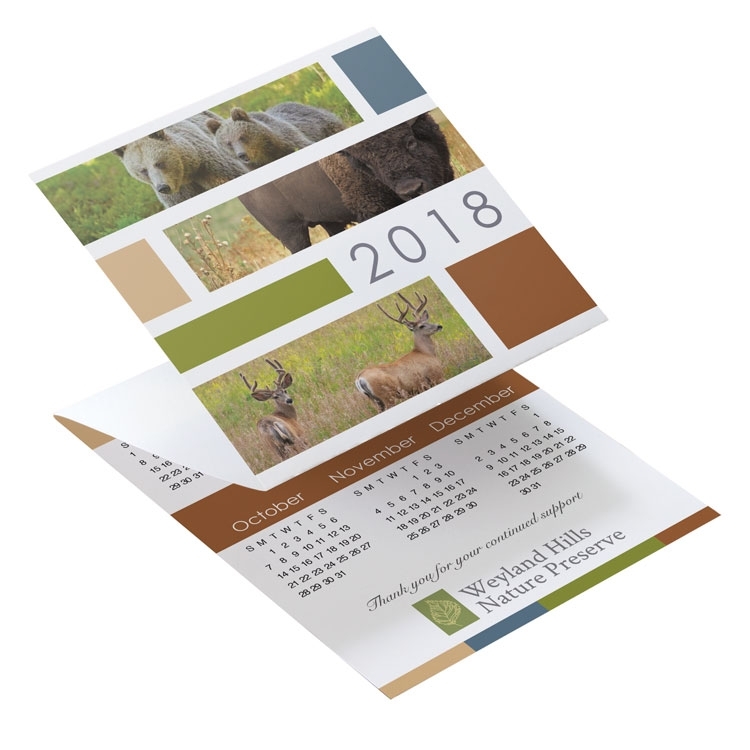 Spiral bound wall calendar. 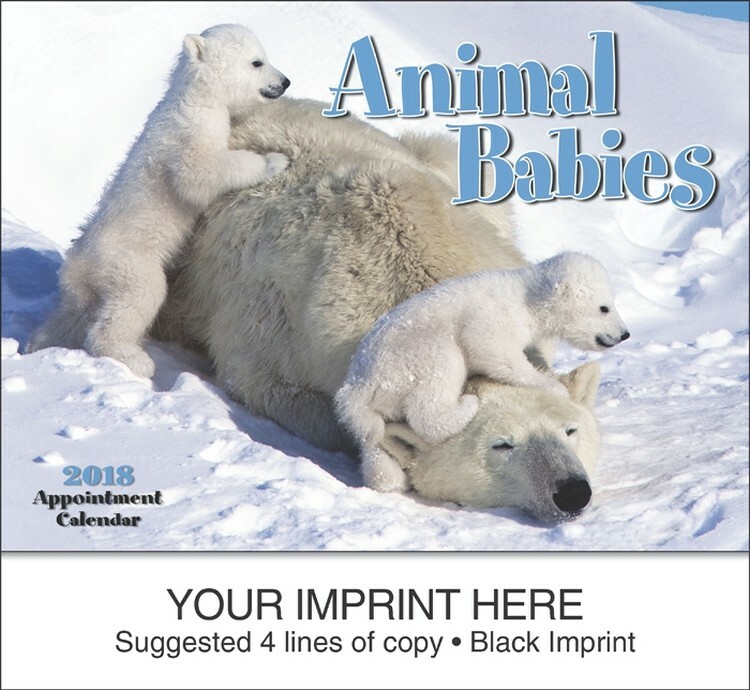 13 month calendar, December thru December with a white spiral binding. 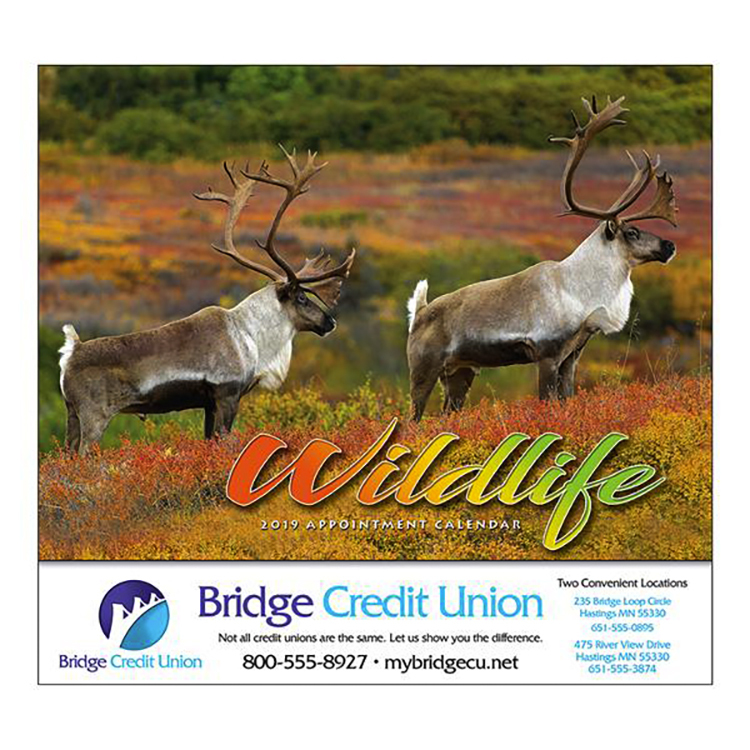 Great for insurance agents, brokers, financial consultants, banks, healthcare, manufacturing, etc. 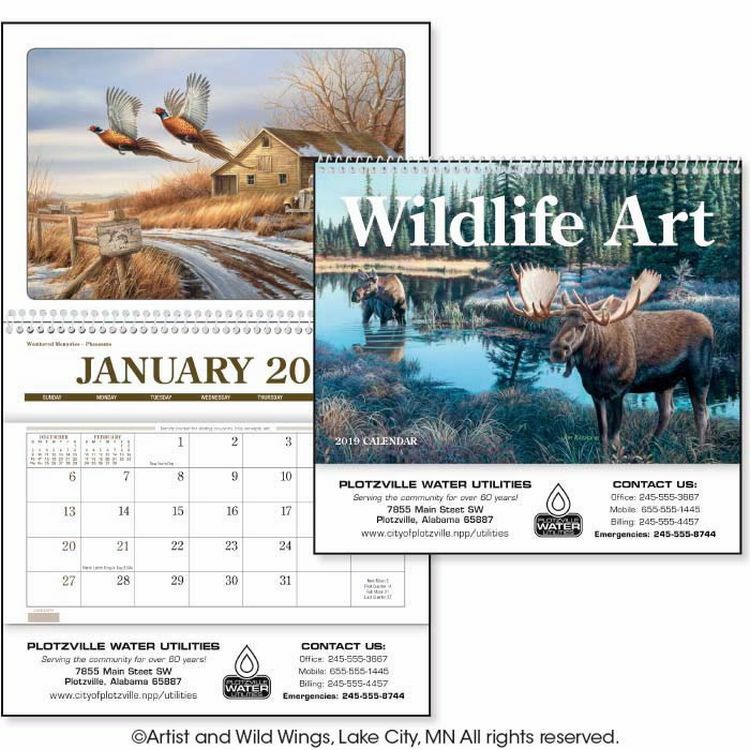 Reproductions of original paintings by the well-known Hautmans make this a powerful wildlife calendar. 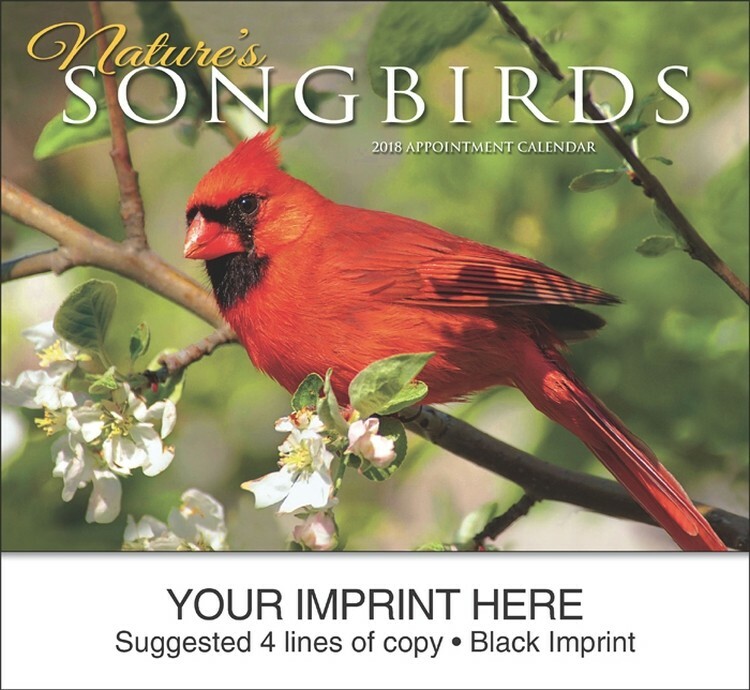 Personalize this calendar for a wonderful executive gift. 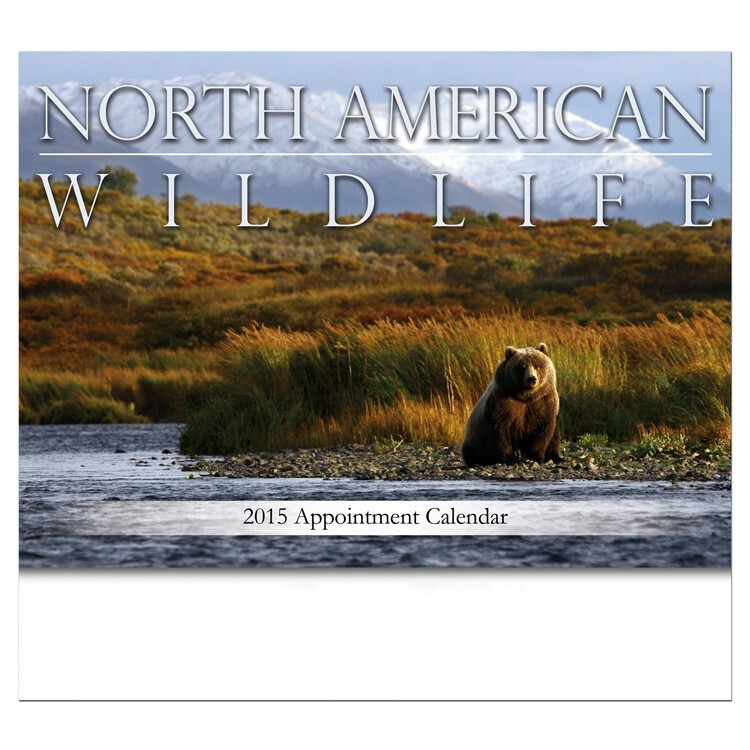 Great for insurance agents, brokers, financial consultants, banks, healthcare, manufacturing, etc. 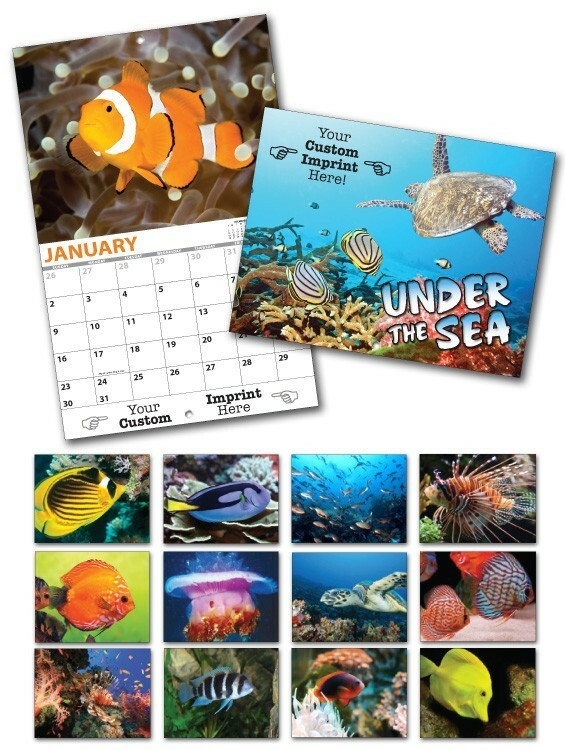 CUSTOMIZE THE ENTIRE CALENDAR IN FULL COLOR WITH JUST A 50 PC. MINIMUM! NO EXTRA CHARGES AND NO SET-UP CHARGES! 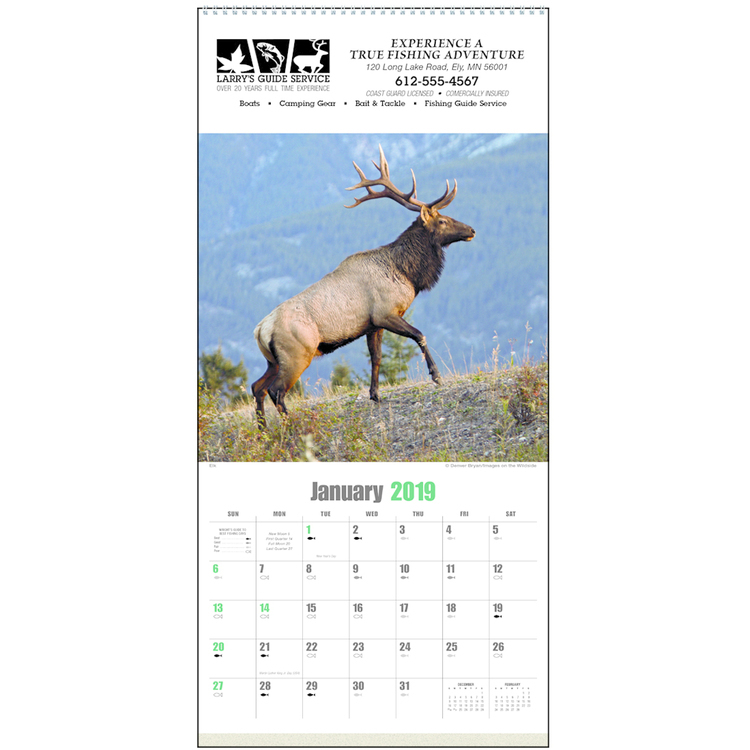 Tri-fold Calendars are available in 8 stock designs with your imprint, or completely customized with no additional charges and no set-up charges. 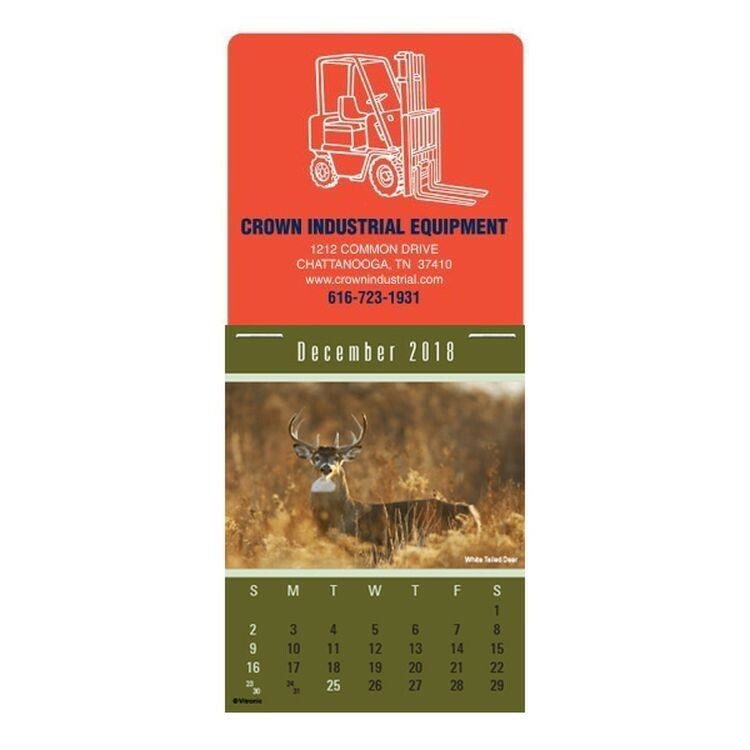 Printed on sturdy 12 point, smooth-finish white cardstock with from one color to full 4-color process printing included on both stock and custom designs. 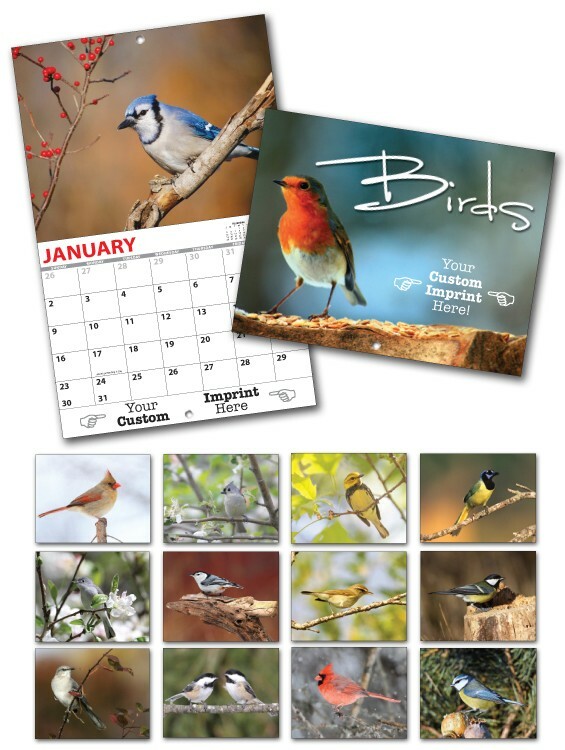 Calendars fold to fit perfectly for easy mailing in the free envelopes included, calendars not inserted. 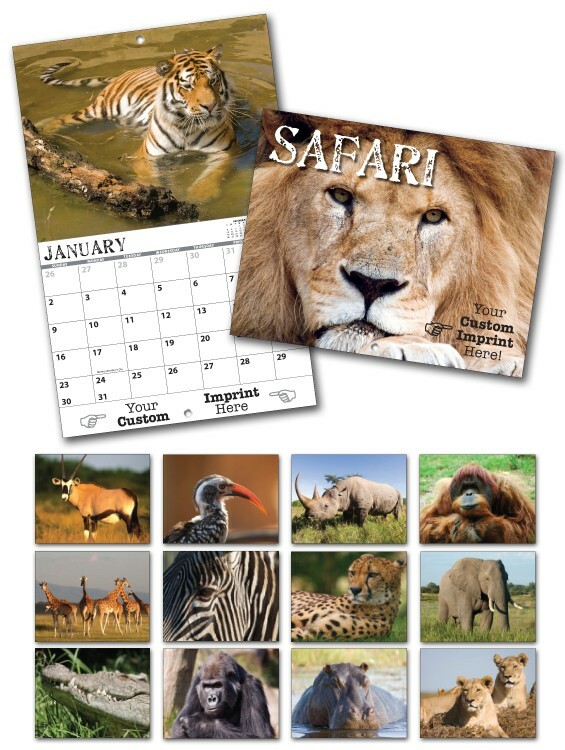 Create your own custom calendar using our stock WILDLIFE theme. 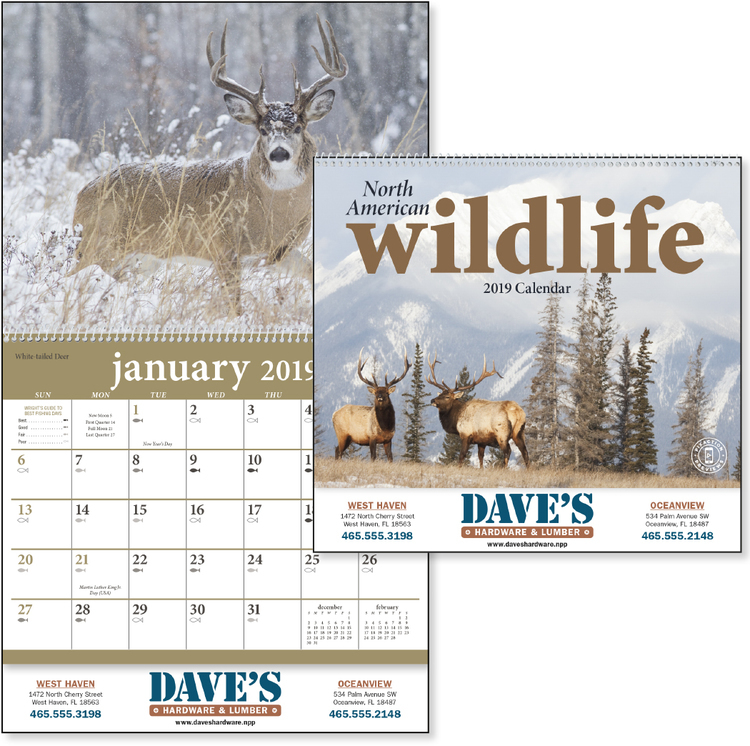 Calendars are printed in full-color (four color process) on 80# Gloss Text. 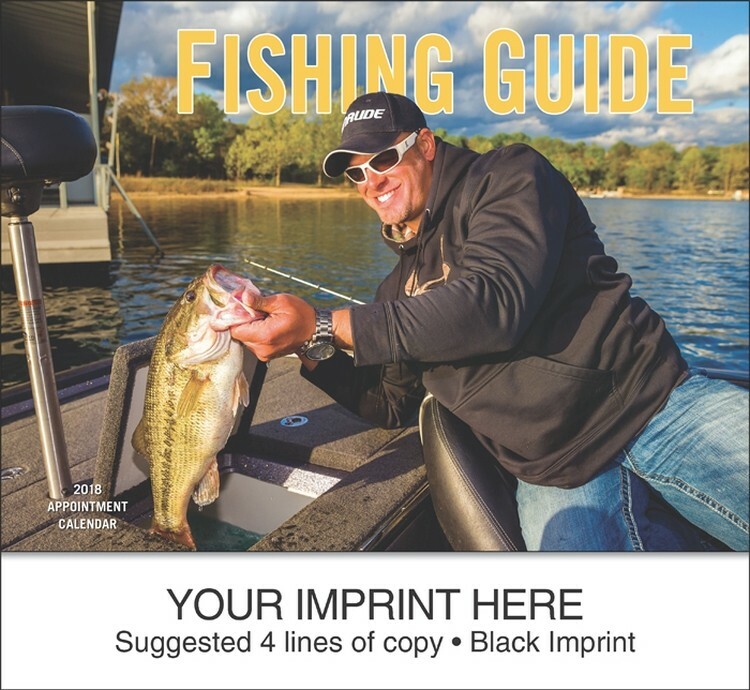 The cover is UV coated 8pt C1S. 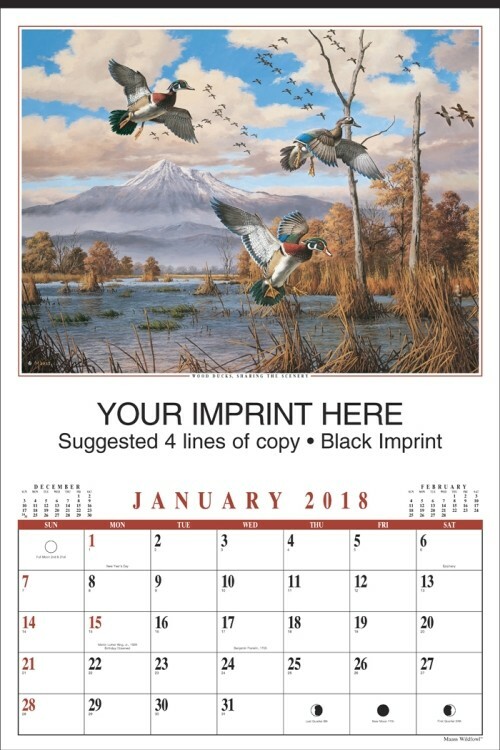 These calendars are 8.5x11 open and 5.5x8.5 closed. Bound by two stitches and have 1 hole drilled for easy hanging. 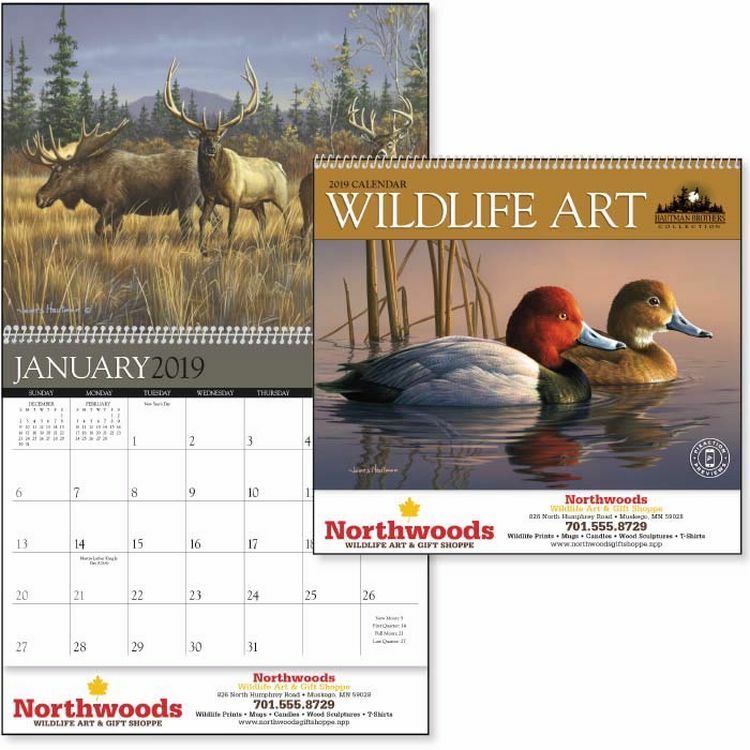 Enjoy vibrant, detailed paintings of North American wildlife in this calendar. 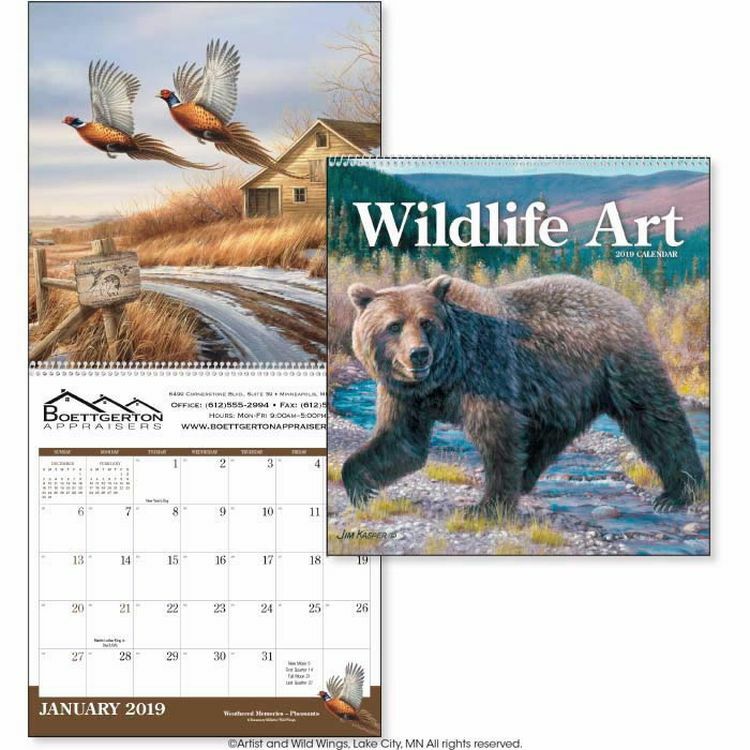 This calendar examines detailed wildlife paintings to bring the outdoors inside. 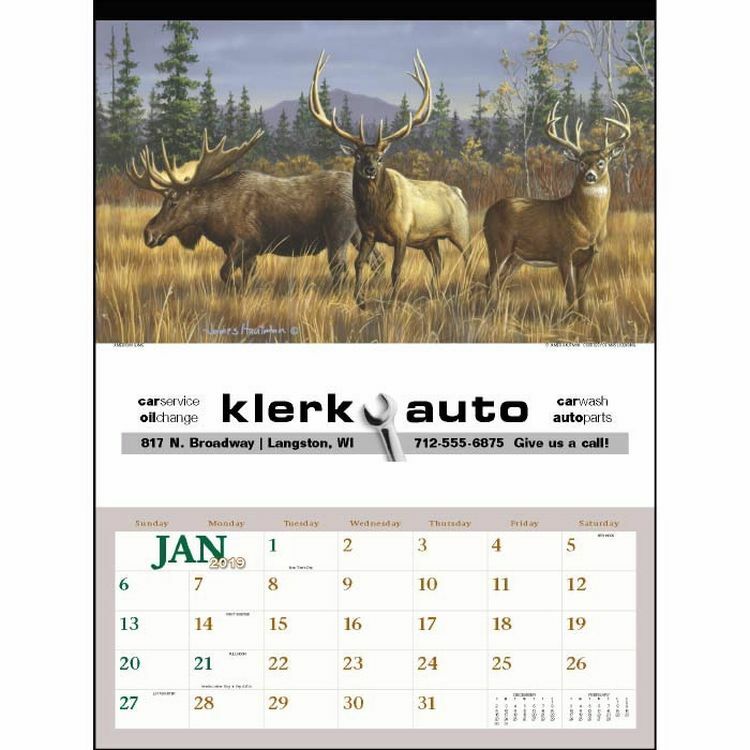 Created with the sportsman in mind, this calendar is sure to impress. The intense photographs of wildlife, along with interesting tips for the outdoor individual, guarantee this calendar will be noticed. 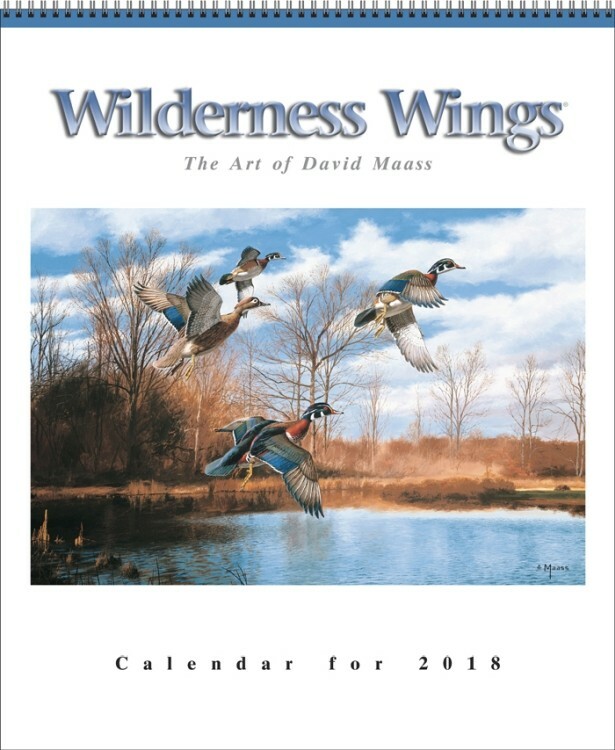 Reproductions of oil paintings by well-known wildlife artists create a stunning calendar. 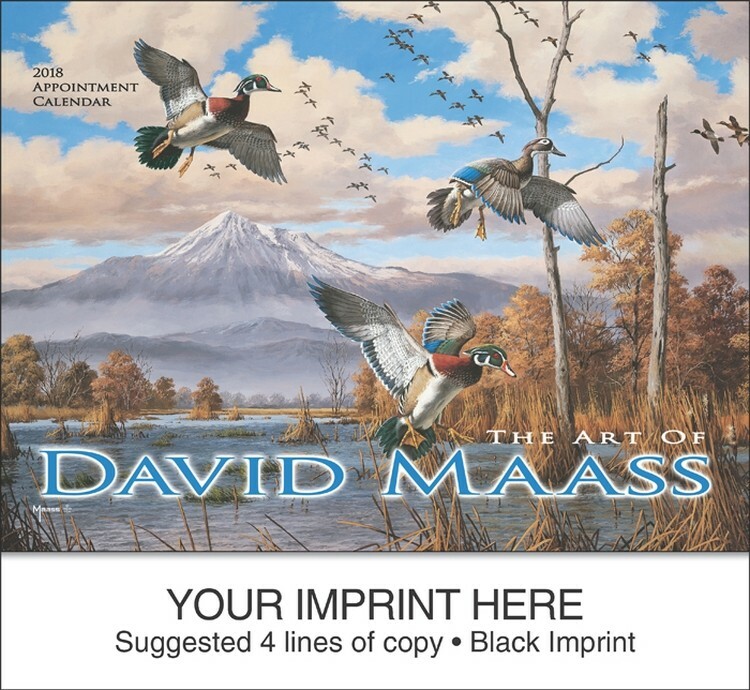 Detailed wildlife paintings bring the outdoors inside. 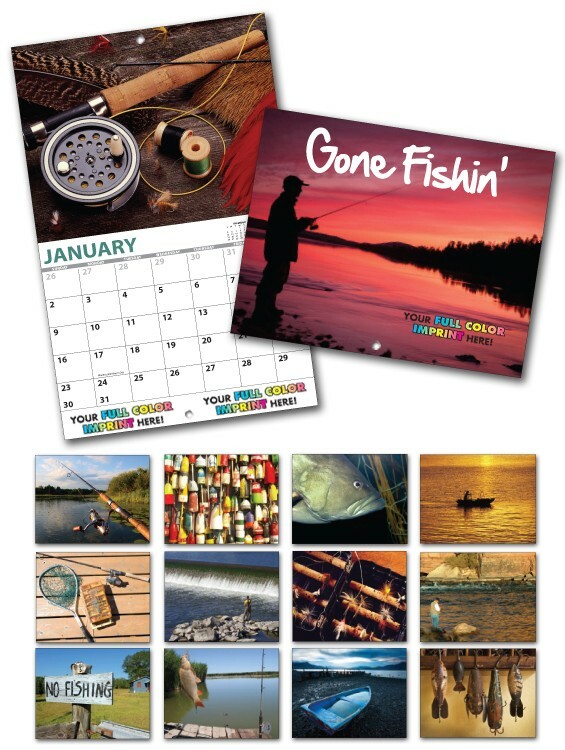 For those who appreciate the outdoors, this calendar contains the highly regarded Wright's guide to the best fishing days. 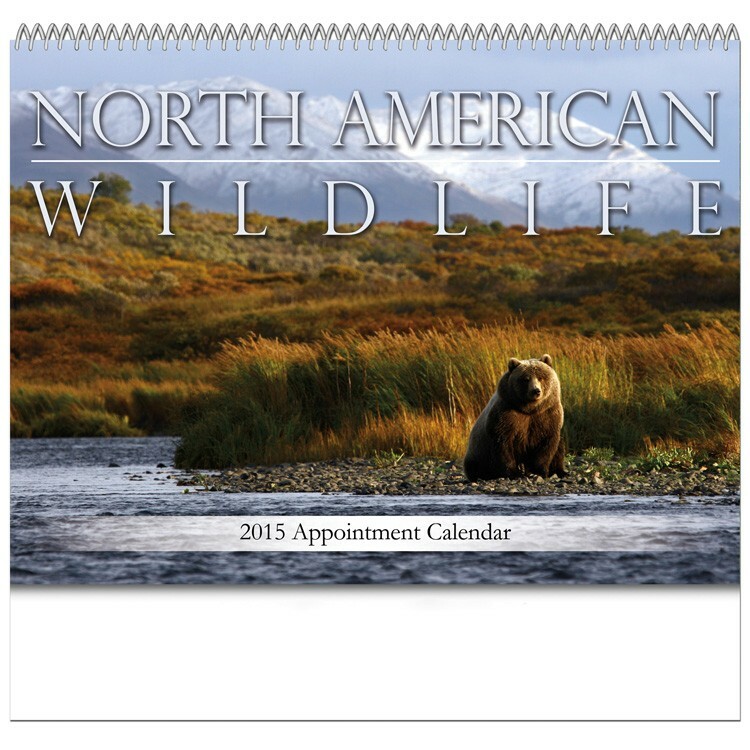 Perfect for planning outdoor activities in advance. 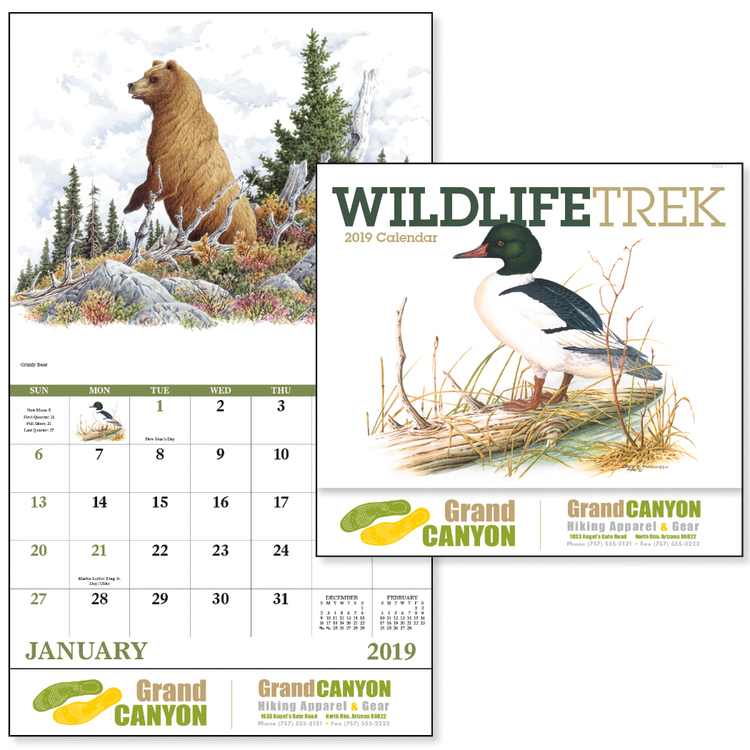 This calendar features vibrant, detailed paintings of North American wildlife. This great pocket calendar, featuring outstanding artwork from top wildlife artists, will be a popular choice for sporting goods stores and financial institutions, along w/ many other businesses and organizations.